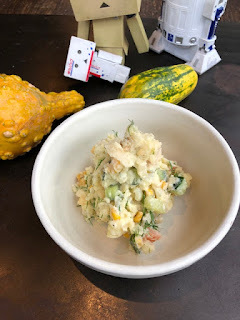 Japanese Potato Salad: Cucumber, Carrots, Onion & Sweet Corn. Kewpie Mayo, Dill & White Pepper. Teba Shoga Ni: Chicken Wings simmered in Soy Ginger Dashi with Gobo/Burdock, Bamboo Shoots, Carrot, Daikon Radish and Shiitake Mushroom.